Rangers' current board has been re-elected following the club's annual general meeting at Ibrox. BBC Scotland learned earlier this week that the board had won enough support to remain in place. Current chairman David Somers, chief executive Graham Wallace and three directors have all been re-elected. And nominees, including Paul Murray, did not secure the votes necessary to join the board. Malcolm Murray, Alex Wilson and Scott Murdoch also failed in their attempt to be appointed. Rangers chief executive Graham Wallace won the greatest amount of support with 85.5% in favour. 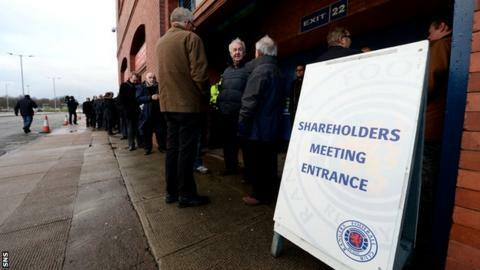 Finance Director Brian Stockbridge, who came under heavy criticism from shareholders at the AGM, received 65.3%, the lowest of the five board members. Paul Murray was backed for election to the board by 31.7%, with his fellow nominees receiving slightly less support. Wallace expressed delight at the result of the vote and said the board was committed to improving the Ibrox club. "The board sought a clear and decisive mandate from shareholders to provide a platform for stability and is pleased that the voting has provided this," he said. "The board recognises that improved engagement with supporters is a major area of focus and is committed to reviewing how the club engages with the wider supporter base. "I wasn't brought in here to win a popularity contest"
"We now require a period of stability in order to take the business forward and I encourage everyone with the best interest of Rangers at heart to support fully the new board in developing the club and growing shareholder value." Former Rangers director Paul Murray, one of the four unsuccessful candidates aiming for election onto the board, said the campaign had been far from fruitless. "We brought all the issues to the fore," said Murray. "We have got transparency on what's been happening at the club. "We've forced change; the six directors who where there when we started this process five months ago, there's only two left. "They've been forced to bring on a couple of decent additions to the board. Graham Wallace is a credible chief executive and I hope he can take the club forward." Scot Murdoch, one of the four unsuccessful candidates aiming for election onto the Rangers board, has urged supporters not to boycott next season's ticket sales. "At the end of the day all four of us, unlike the board, are all Rangers fans," he said. "We also have season tickets and don't want to see the club suffer. If everyone fails to buy season tickets then the club will be in a financially perilous state in a few months' time. "That's not what we're trying to advocate at all." Stockbridge, who was booed by angry shareholders at Ibrox, defended the cost of setting up the IPO share issue, which raised £22m a year ago. We brought all the issues to the fore and have got transparency on what's been happening at the club. "I wasn't brought in here to win a popularity contest," he said. "Hard financial decisions had to be made. One of those was to pay the fees that were necessary to secure the club." One shareholder asked Stockbridge about a clause in his contract entitling him to share options worth £500,000. "Yes, I'm entitled to shares as set out in the prospectus," he said. "But because of everything that has happened in the club, I haven't taken them so far." Rangers chairman David Somers told shareholders the board would not sell and lease back Ibrox, also insisting neither Craig Whyte nor Charles Green had any influence at the club. Some supporters were unhappy with the criticism levelled at the re-elected board. Ian, 61, from Wishaw, said: "There was a bit of rabble rousing. I thought the chief executive and chairman spoke very well but some of the Rangers supporters in there let the fans down." Colin Foster, 40, from Livingston, added: "Most people were reasonably supportive of the board, particularly the new members. They are big hitters and I've got confidence in them. "But I'm concerned with the sizeable, vocal group that were against the board. That needs to get sorted one way or another." The club reported a £14m operating loss for the 13 months to June.